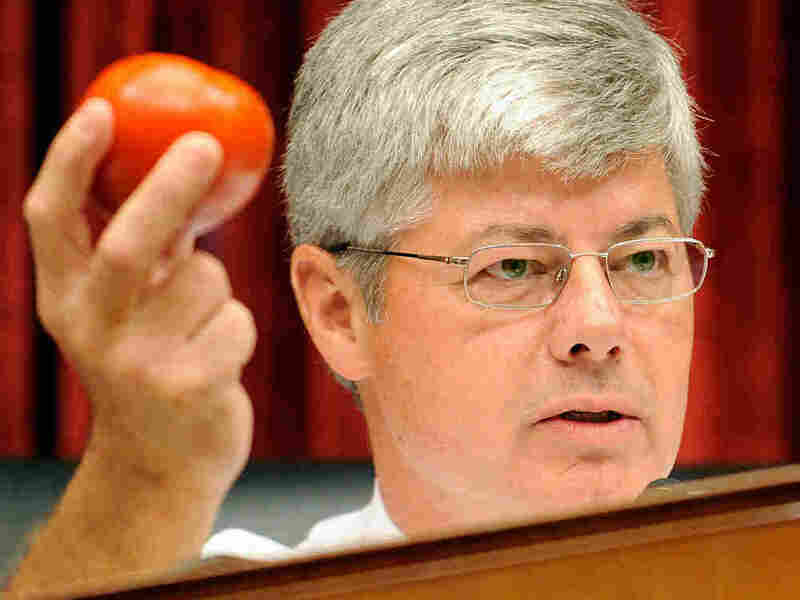 Rep. Bart Stupak of Michigan, who said he won't run for reelection, holds up a tomato at a 2008 hearing on a salmonella outbreak. When staunch abortion opponent Rep. Bart Stupak of Michigan said today that he would retire at the end of this year after 9 terms in Congress, he said: "My main legislative goal was accomplished," referring to health care overhaul. But he will no doubt be remembered for his thorny but pivotal role as the guy who almost took down that bill over abortion funding. However, the abortion fight was not this former state trooper's full rap sheet on health matters. He leaves a legacy of collaring the Food and Drug Administration over its lax drug warnings and weak oversight of food safety, too. So let's get the abortion rehash out of the way first. Back in November, Stupak won language in the House-passed bill that would not merely ban federal abortion funding, but, according to many abortion-rights groups, would have scaled back private abortion funding as well. That language was modified in the Senate, and Stupak, not wanting to kill the health bill, but neither wanting to compromise his career-long anti-abortion values and voting record, cut an eleventh-hour deal with President Obama. Under that deal, the President would issue an executive order promising not to interpret the Senate bill to allow any federal abortion funding. Stupak and the band of anti-abortion Democrats said they were satisfied no abortions would be federally subsidized under the new law, and voted for the bill. Anti-abortion groups, however, were not convinced. But Stupak leaves a much broader legacy as a member and then the chairman of the powerful oversight subcommittee of the House Energy and Commerce Committee. From that perch he presided over dozens of hearings and investigations, most of them aimed at FDA's shortcomings. Stupak didn't exactly come at the FDA with a neutral viewpoint. In May of 2000, Stupak's 17 year-old son B.J., committed suicide while taking the acne drug Accutane. That led Stupak to launch a crusade to get the agency to strengthen the warnings about suicidal thoughts associated with some who take the drug. After taking over the helm of the powerful investigatory subcommittee in 2006, Stupak used his dogged, if a bit plodding, style to play Javert to the FDA's Jean Valjean. He took the FDA to task for alleged conflicts of interest, for failure to do its job in policing everything from poisoned spinach and peanut butter to the tainted blood thinner heparin. Stupak played a significant role in the passage of the 2007 law that revamped FDA's food and drug safety powers. Those accomplishments, however, will almost certainly be overshadowed by the more recent fireworks over abortion.